Every box comes with a copy of TinkerZine magazine, which includes articles about that month’s theme, as well as smaller projects and experiments. This month’s theme is the butterfly effect! I do this box with my eleven-year-old son. Here’s a peek at the table of contents from this month’s TinkerZine, plus a look at some of the pages inside. In addition to the large project that Tinker Crate sends, the magazine has several articles plus smaller projects you and your child can undertake to gain a deeper knowledge of the scientific principles of that month’s topic. This month’s big project is a glowing pendulum! So awesome! Here’s a peek at the instructions this month. They may look a little intimidating, but they are always very clear, complete, and easy-to-follow. These were the materials Tinker Crate supplied for the project. With Tinker Crate, sometimes you have to supply a few things, but they are always items you have at home, like scissors or water. This month they included everything we needed for the project. 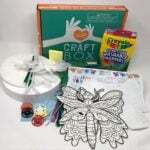 Sometimes Tinker Crate includes some supplies for the smaller projects in TinkerZine, too. My son’s first step was to assemble the glow board. He did this by unfolding and applying velcro dots at the specified locations. The dots were self-adhesive. Then he folded and attached the velcro as directed. Next, he assembled the lower half of the pendulum arm. He had to insert the battery pack and LED into a bracket, separate the LED pins and then screw it all together onto the wooden piece. Then he attached the battery pack wires to the LED. He then attached the assembly from the previous step to the rest of the pendulum arm with more plastic screws. He then attached the base of the arm to the glow board with more plastic screws. His final step was to attach the arm to the base. This is his completed glowing pendulum! Here it is in action, so cool! Both of my sons completely love this! The Verdict: We love Tinker Crate! This month’s project was so fun! I really appreciate how it gets both boys interested in engineering. The nine-year-old ends up playing with the eleven-year-old’s creations. I actually don’t know how Tinker Crate comes up with such great project ideas month after month. They also send quality materials and provide loads of educational content. It’s a huge value for $20! Can you still get this box if you sign up today? No, sign up now for the February box. That was really cool. Good work, kiddos!